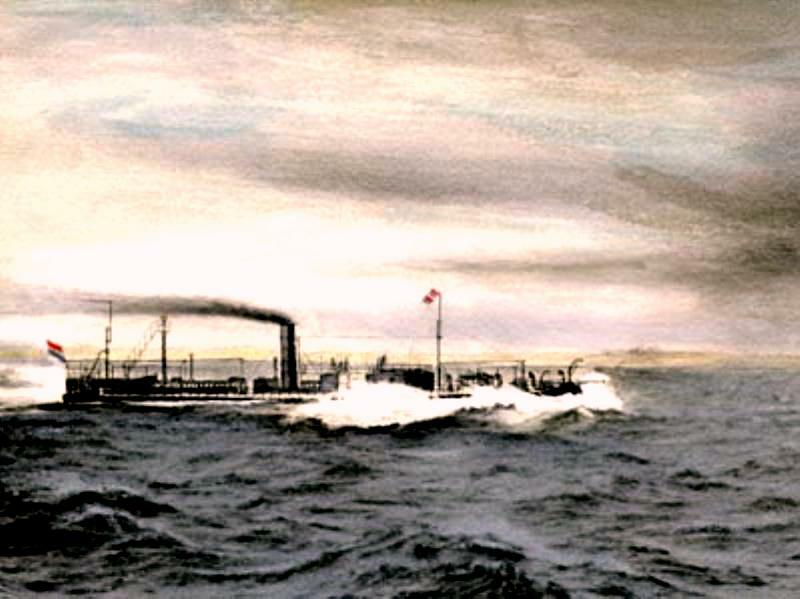 It is well known that the USS Monitor, which can be argued to be the first modern warship, and which gave its name to an entire class of warships which would see service until the end of WW2, was lost off Cape Hatteras in late 1862. This resulted from a very low-freeboard vessel being exposed to heavy seas – conditions such ships were never intended for since they were designed as mobile and heavily-armoured batteries for service in sheltered waters such as river estuaries. Sixteen men died when the Monitor sank but the scale of the tragedy was dwarfed by the much heavier loss of a later, more sophisticated, vessel of the same type in 1882, the Adder of the Royal Netherlands Navy. The monitor concept proved to be a very attractive one for the Dutch Navy, tasked as it was in home waters with defence of the approaches to its two largest cities, Amsterdam and Rotterdam. The Netherlands coast in the mid-19th looked significantly different to what it does today. The Zuider Zee, the huge and shallow sea inlet to the north-east of Amsterdam would not be closed off by an enormous dyke until 1932, and much of the area within it reclaimed. The Delta area in the south of the country, where the rivers Rhine, Maas and Schelde enter the sea, was a labyrinth of individual channels, some giving access to Rotterdam, and would remain so until the vast “Delta Works” were undertaken in the 1950s and 60s to close them off. With increasing sizes and draughts of ships in the 1860s and 70s access to Amsterdam and Rotterdam through the Zuider Zee and the Delta proved increasingly difficult. The solution was to build two large-scale ship canals, both running due west from these cities to new openings on the Netherlands West Coast. Opening in the 1870s, and engineering marvels of their time, both waterways have been regularly increased in dimensions and capacity in the years since. The two new waterways changed the pattern of sea-borne mercantile access to the Netherlands, and given their single points of access to the sea were easily defensible by shore batteries. In the event of war however – even though the Netherlands was not liable to any significant threat from other European powers in this period – the possibility of enemy access to the country’s heartland through the Zuider Zee and the Delta could not be ignored. Shallow-draught monitors represented an ideal mobile defence for these areas. Speed and sea-worthiness were not major requirements since the vessels would be required to operate over short-distances in largely land-locked conditions but heavy armouring and heavy weapons would make them formidable opponents to any invading force. Between 1868 and 1878 thirteen monitors were completed for the Netherlands Navy, substantial ships of around 1500 tons and when fully manned demanding a crew of some 115 men. Since a design requirement can be deduced as being not to exceed a draught of 3 meters (9.75 ft) very limited accommodation was provided, or indeed required, since the crews could be housed in barracks ashore when the vessels were not exercising. 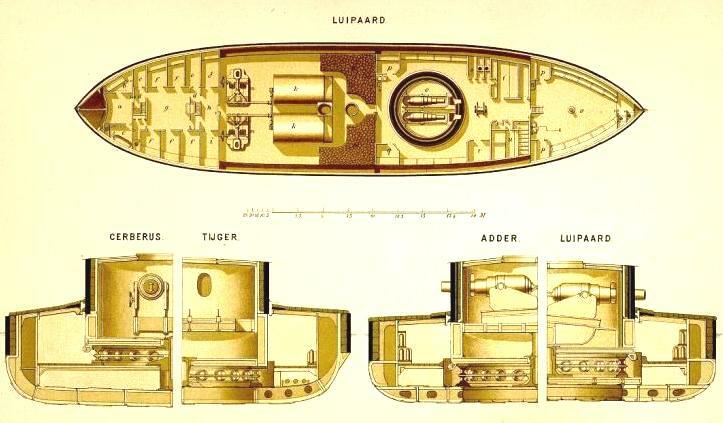 Long, narrow upperworks abaft the single turret seem to have been mainly designed to provide light and ventilation to the spaces below, as will be seen from the contemporary illustration below that show the Luipard in plan view and she and three other monitors in cross-section. 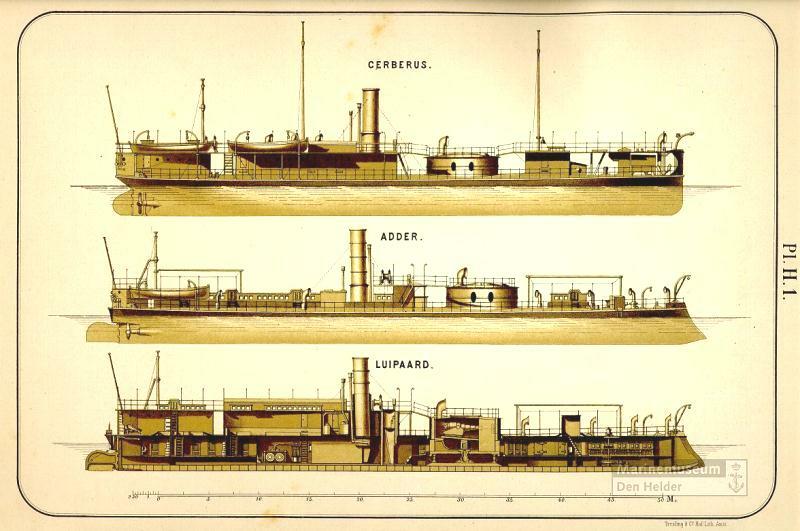 The Adder gave her name to a class of six vessels which was completed between 1870 and 1876. All were fitted with ram bows as ramming was still regarded as a viable tactic, especially in confined waters. One can only wonder if these monitors had the necessary maneuverability to allow this tactic to be a practical proposition. 192 ft. long and of 1555 tons, these vessels were heavily armoured with iron – 5.5” on the hull sides and between 8” and 11” on the turret. Two 9” muzzle-loading rifles were carried in the turret. Speed as low – maximum 7 to 8 knots and horsepower varied from ship to ship in the range 560 – 740 IHP. 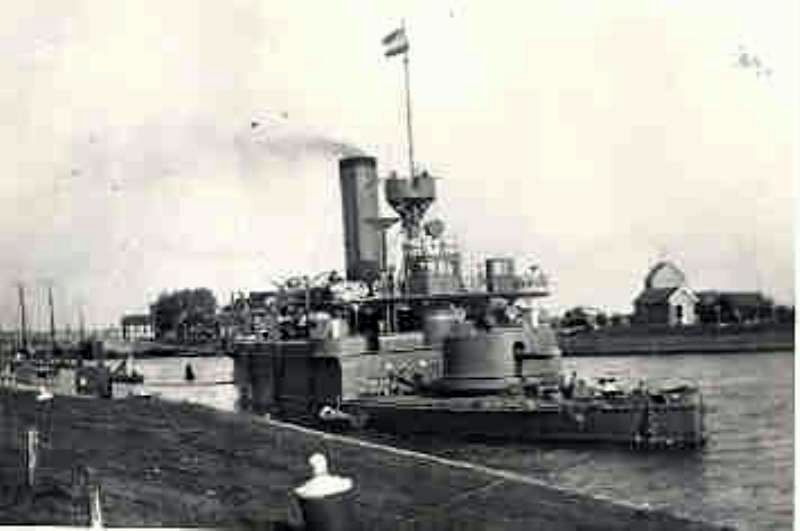 By the nature of their design, and of their likely tactical use, such vessels spent little time in the open sea, their greatest exposure to such conditions being apparently when they moved parallel to the Netherlands coast when transferring from Ijmuiden or Den Helder in the north, to the base at Hellevoetsluis in the Delta region. It was on such a voyage south, a short one, that the Adder set off from Ijmuiden on the morning of 5th July 1882. The stretch of coast involved consisted of long open beaches. A difficult passage was expected as the vessel did not perform well with wind on the beam and in even moderately heavy waves the decks would be awash. By early afternoon a strong south-westerly was blowing on the starboard beam and the monitor was sighted close inshore, off the fishing village of Scheveningen, a suburb of the Hague and which did not then have a harbour which could have offered shelter. (The present harbour there dates from 1904). Though the seas might have provided problems for the Adder they were not bad enough as to interrupt the activities of Scheveningen fisherman. At 1800 hrs a fishing skipper, Abraham Westerduin, sighted the Adder – seas were washing across her up as high the funnel – and he judged the situation to be sufficiently serious as to decide to stand by to render assistance if possible. Around 2030 the monitor, now obviously in desperate straits, began to shoot off red, white and green rockets. Some 40 minutes later there was one last flash – a large one – and a cloud of smoke, or perhaps steam, and then nothing more was to be seen of the monitor. She had disappeared with all 66 men on board at the time. In the flowing days several bodies wearing life-belts were recovered. A note found in an officer’s pocket indicated that a decision had been taken at 1800 hrs to turn back to Ijmuiden, the nearest harbour, but the monitor proved incapable of responding to the helm in the conditions prevailing. This was confirmed when the wreck was examined by a diver two weeks later – it lay just over a mile to the north-west of the Scheveningen lighthouse (still in existence today) and in 60 ft of water depth. The bows were pointed southwards, and not north towards Ijmuiden. A flag signal calling for tug-assistance was also found but it does not appear to have been sighed from shore. The boiler was intact and but the cause of the loss appeared to be large volumes of water spilling down into the engine room through deck openings. The inevitable enquiry followed. Not unexpectedly the unsuitability of monitors for use in the open sea was a major issue but the final responsibility was laid on the Adder’s officers. The vessel’s captain appears not to have had previous experience or training in handling monitors but the responsibility for assigning him – which must have been higher up in the naval hierarchy – appears to have been skated over. The Adder disaster evoked an outpouring of sympathy throughout the nation and a fund was set up to support the crew’s widows and orphans. A further consequence was the spontaneous decision by a group of naval officers to set up the Royal Association of Naval Officers, which still exists today and is the oldest professional association in the Netherlands. The monitors continued in service, but one assumes in conditions that took account of the Adder experience, and only one further one was built for the Netherlands Navy, the Reinier Claeszen of 1891. The Wikipedia entry (in Dutch) on this vessel describes her as “not fully seaworthy: it steered badly and encountered serious maintenance problems.” This seems perhaps an appropriate epitaph for all these unfortunate vessels. In Britannia’s Spartan Captain Nichols Dawlish headed to unexpected dangers in the Far East in the cruiser HMS Leonidas. He left behind in Britain his indomitable wife Florence, who was determined to fill the months of separation with welfare efforts to support seamen’s families. She expected it to be dull work – if worthy – but a chance encounter was to bring her into brutal contact with the squalid underside of complacent Victorian society. On home ground she faces hazards and betrayals every bit as deadly as her husband does in Korea and the powerful enemies she threatens are prepared to stop at nothing to frustrate her. 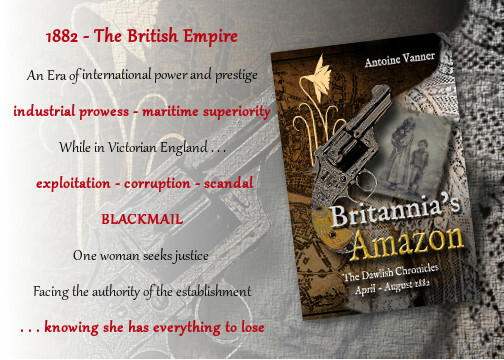 Britannia’s Amazon – strongly linked to actual events – tells her story. Registering for the Dawlish Chronicles mailing list, by clicking on the banner below, will keep you updated on new books and facilitates e-mail contact between Antoine Vanner and his readers for discussion of issues arising.